This week, our little garden is all about peas and radishes, beats, asparagus, and spring onions. Once again, we're challenged with using our home-grown veggies to make a healthy AND appealing meal. We are not a family of bunnies, though some of us sure like to hop around and pull things out of the garden. 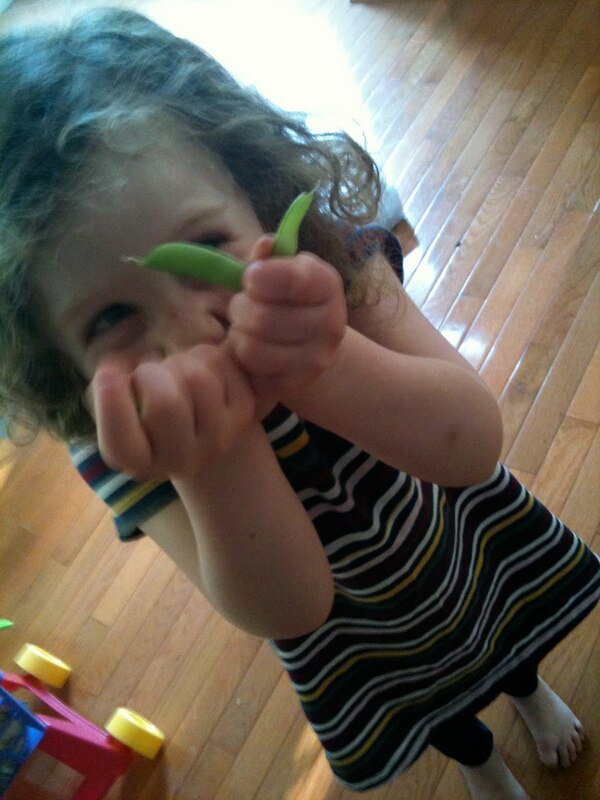 After an exciting 15 minutes of pulling sugar snap peas off the vine, I struggled with the always-too-late question: what can we do with these in time for dinner? I set Juniorette to washing while I racked my brain for recipes. It turned out the sugar snap peas were so sweet and crunchy that only a few made it out of the sink. Which is fine, really. Isn't this the point? Well, yes, but...we still need to eat dinner. Inspired by the peas, and having discovered some still good potatoes in the fridge, I came up with Aloo Matar. On the side: green salad with radishes and pea shoots. I've been dying to do something with pea shoots ever since we enjoyed a delightful meal at BlackSalt. On the menu was a pea shoot and strawberry salad. Price: $15. Really?! So I snatched a few shoots off our vine, chopped up the radishes and spring onions, sheared the tops off our little crop of never-ending greens, and Voila! Dinner. Cook the potatoes until tender. Peel and set aside. In the container of a blender or food processor, puree the onions, garlic, and ginger. In a large heavy-bottomed skillet over medium heat, warm the oil. Add the cumin. When the cumin darkens (1 to 2 seconds) add the purred onion mixture and saute until browned (about 12 minutes). Add the salt, cayenne, turmeric, and tomatoes and cook until they soften (about 5 minutes). Add the peas and water, reduce heat to low, cover and cook for 5 minutes. Halve the cooked potatoes and add them to the skillet and cook covered another 5 minutes. Mix in the garam masala just before serrving. Note: Do not overcook the potatoes in the first step. Yum yum yum!!! I am really enjoying your blog! Thanks for listing this recipe - I will make it sometime! I love snap peas too:) Never heard of a pea shoot salad - interesting...ok - now I am off to make some asparagus soup while Mir and S are resting:) Talk soon!